Drop that yogurt. Instead, try this one with less sugar, fat and fewer unpronounceable additives. That's the message from FoodSwitch—a free mobile app developed by Northwestern researchers. Using FoodSwitch is like having a nutritionist at your side in the grocery store. "FoodSwitch is unique in that users don't have to hunt for healthier alternatives. They're all listed in the app," said FoodSwitch collaborator Dr. Mark Huffman, associate professor of preventive medicine and medicine at Northwestern University Feinberg School of Medicine and a Northwestern Medicine cardiologist. Unlike other nutrition apps, FoodSwitch asks users to crowdsource information on new and changing foods within the U.S. food supply to update the app's 268,000-product database in real time. Given that 20 percent of the packaged foods in the U.S. turn over every year, having a constantly updated database helps track what is in the global food supply and how healthy it is. Although the app will officially launch June 28, it is already available in Apple and Google Play stores. SaltSwitch, a salt-focused filter within the app, will be available Monday, June 25. SugarSwitch and FatSwitch modes will be available for those on specialized diet plans in the coming months. FoodSwitch USA was developed by The George Institute for Global Health in Australia in collaboration with Northwestern Medicine and Chicago-based Label Insight. 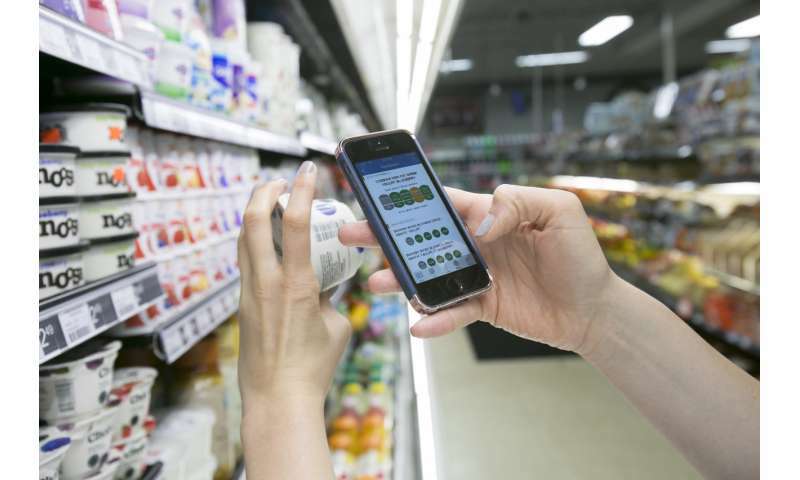 With a tap of the screen, users can scan a packaged food's barcode, quickly see its nutritional rating and identify similar foods that are healthier. The app provides a simple Health Star Rating that scores each food between 0.5 stars (unhealthy) to 5 stars (healthiest). The scoring is based on a scientific algorithm that weights the impact of different nutrients on health. The app also provides a breakdown of the food's fat, saturated fat, sugars and salt in grams and gives a percentage of an adult's daily intake for each. This is shown as red, yellow and green traffic lights. When a food gets few stars or multiple red lights, consumers can see it's high in fat, saturated fat, sugars and salt. "That's when you should take a step back and say, 'Maybe, I shouldn't be eating this. What else is out there?'" Huffman said. Users also can compare multiple products in the same category, such as regular and fat-free salad dressing, to quickly determine which product is healthier. If a user scans a barcode and the food is not in the database, the app prompts the user to photograph the packaging, its nutrition facts panel and ingredient list so the app's team can add it to the database. 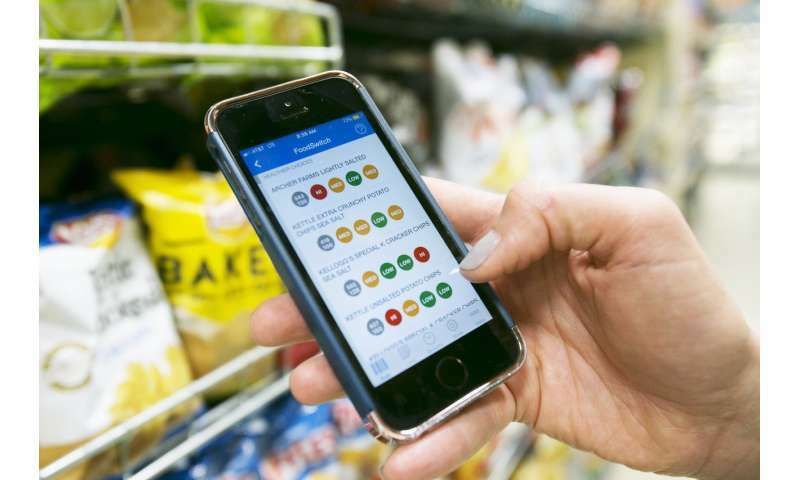 This type of crowdsourcing is vital for the app's success, Huffman said, because manufacturers frequently update or add products, and independent grocers carry foods that are not always found in mainstream grocery stores. There is an approximately 20 percent turnover in the U.S. food supply every year, he said. "Our food supply is a big system that changes constantly," Huffman said. "FoodSwitch is a really good way to capture that change in real time because people are so interested in food. We think users will want to participate in building the largest, most up-to-date database." Packaged food manufacturers change their products frequently, which can make it difficult to track how well they are reducing sodium, added sugars or saturated fats in their foods. FoodSwitch can help. As users crowdsource new information they find on packaged foods and update the FoodSwitch database, it will become easier to track what's in the global food supply and how healthy it is. Huffman said it is important to empower individuals who know they should be eating healthful food but who don't always have easy access to it. "With FoodSwitch, we're making it easier for consumers to know what's in the food they're eating, so they can make healthier purchasing decisions," Huffman said. "Since the app tells them which healthier alternatives are out there, they can demand those from their grocers." Excess sodium in one's diet can lead to high blood pressure, the "silent killer," and the majority of excess salt in peoples' diets comes from processed foods. The American Heart Association says eating less sodium can help blunt the rise in blood pressure that occurs with age,and reduce the risk of heart attack, heart failure, stroke, kidney disease, osteoporosis, stomach cancer and even headaches. A SaltSwitch filter within the app can guide users to foods with less salt. 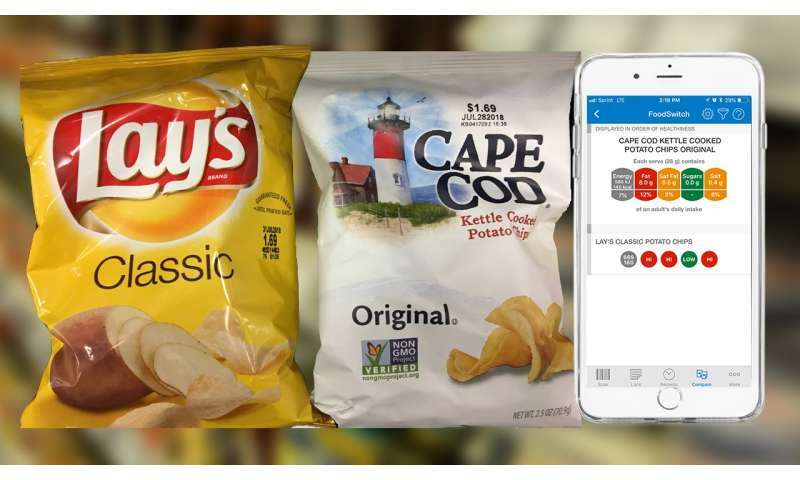 During a recent grocery shopping trip, a SaltSwitch scan of a bag of Lay's classic potato chips resulted in three red traffic lights (fat, saturated fat and sodium) and one green traffic light (sugar). The list of healthier alternatives suggested trying Lay's Lightly Salted Potato Chips instead, which had only two red traffic lights (fat, saturated fat), one yellow traffic light (sodium) and one green (sugar). With Fourth of July cookouts around the corner, it's important keep in mind that, on average, a meal consisting of two hotdogs and two servings of chips will account for a whopping 117 percent of a person's recommended daily sodium intake and 75 percent of their recommended daily total fat intake. Using the SaltSwitch filter, a recent FoodSwitch scan of hotdogs said, "There are no low-salt products in this category. We have listed any similar products with a healthier profile and less salt, but suggest you limit your intake in this category." FoodSwitch can help cookout hosts make healthier choices at the grocery store for their guests by scanning products to find lower-sodium alternatives. FoodSwitch has already launched successfully in Australia, New Zealand, the United Kingdom, India, China, South Africa and Hong Kong. FoodSwitch is novel because, unlike other apps, the FoodSwitch team will use data to monitor and improve the healthfulness of the U.S. food supply by linking FoodSwitch USA to its global partners for cross-country comparisons. If similar products are healthier in other countries, Huffman and his team want to help Americans know and to press manufacturers to improve them. "We need detailed information on our food supply to improve it," he said. The FoodSwitch team also is developing the app as a platform for research to test and improve behavioral and nutritional research. By expanding the app's reach to the U.S., which has the largest food supply in the world (about 400,000 foods compared to 150,000 foods in Australia), the number of foods in the FoodSwitch database should more than double. The app's database of foods and their nutritional values will continually grow to include foods consumers find in stores such as small, ethnic mom-and-pop shops to supermarkets. "The U.S. food supply is so large and so unique because this is a great country of immigrants," Huffman said. "Whether it's South-Asian foods or Ethiopian grocery stores, we'll be able to capture that scope, size and detail."